The Aesop Parsley Seed Anti-Oxidant Toner comes in a 200ml bottle and has been designed for use every day. Free from alcohol, this toner can be used on all skin types, even sensitive ones. The Aesop toner finishes the cleaning process by removing the last remnants of dirt and any traces of cleanser and prepares the skin for moisturisation. This Aesop anti-oxidant toner contains a range of botanicals that will help to balance the skin including lavender, chamomile and parsley seed. 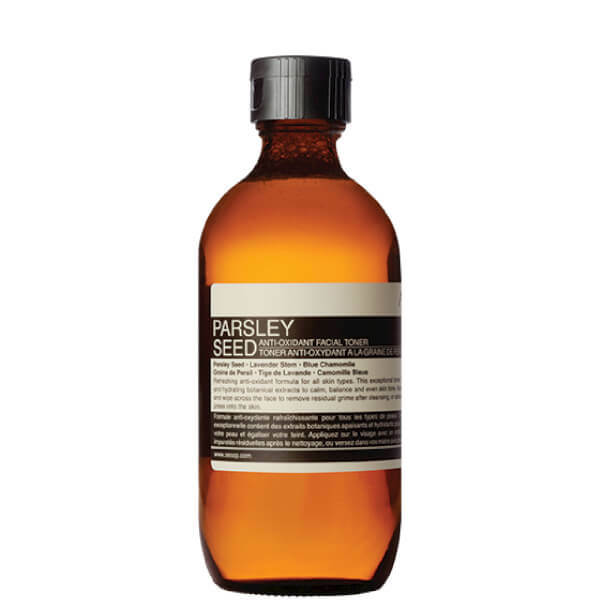 Other benefits of the parsley seed toner from Aesop include refining the pores and helping to create a more even skin tone. Item is good. but it's cap dameged. It’s good to brighten skin.i like it. And the most important is i finally got it in perfect condition for the first time. I hate getting damaged items . First sent over the break, and after contact customer service immediately gave me a replacement, MANKIND is really good.This toner has been used, really feel wrong, the pores are small, moisturizing effect is very good. This is a very gentle toner and i have been using this for two years. It is easy to be absorbed. My skin became more stable and comfortable. I will keep using this. There is nowhere to buy Aesop series in mainland China. So Mankind is one of my best choices. Have used third bottles, very moisturizing, skin white with Parsley Seed essence through good health. Third bottles, with Parsley Seed essence very good, run out of water face very moist, brighten the face up in the morning. Combine with the serum. Really make my skin softer. This bottle of water are felt to be photographed on the skin can be absorbed quickly, like the skin is like a sponge feeling, penetration speed is very quick, replenishment effect is good, the most important with Parsley Seed Series tie-in antioxidant effect is very good! Good product I cannot do without! The product is very moisturizing.It smells so good. I like the smell, and it is useful for me,it is a very good toner. I think it is one of the best toner you can find! I love its smell , it works perfectly . It is priced but you need just few drops when use it. 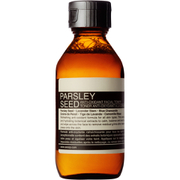 Parsley Seed Anti-Oxidant Toner perfect fragrance. Light but useful! Highly recommend. I bought it,and use it,i feel my skin is soft and hydra then before.Though it's not smells good,but i love it. One friend recommend Aesop. This is the first product i bought from Aesop. It's really paid off. It is refreshing and hydrating. And it leaves my skin soft and soothing. I love it. 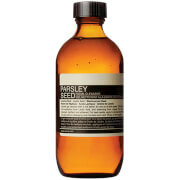 I love the Parsley Seed Anti-Oxidant Toner 200ml, so much so, that I stopped using a moisturiser after I started using it. I just didn't seem to need one any more. It's light, refreshing and leaves my skin feeling clean and supple. It comes in a good sized bottle that lasts for ages. My only criticism is that it should come with an atomiser nozzle (cotton wool sticks to the beard!). I trust on this brand in terms of their fabulous products. I have oily and combination skin, therefore I do not like some products which are sticky and non fresh after washing my face, and oily appears on my T-zone when I wake up in the morning. But truly on this toner, I use in the morning for cleaning condition, in the evening after cleaners, it also can combine with gorgeous serum, they are good matching I suppose to say. But there is only one single problem, I have purchased on the other website before, they do actually sent me a lot of Aesop samples. Which are really useful for me because of high volumes of work on the airplane.